Hi, this is Sarah from Narcoleptic in a Cupboard. A while ago I was so lucky to be given the chance to make something with the beautiful Oakshott Impressions range, courtesy of Lilys Quilts and Oakshott Fabrics. The fabrics arrived quickly and did not disappoint at all - 16 colours shot with white, the effect of which is so soft and shimmery; it's wonderful. Life interviened for a while, but I've finished the quilt top and would love to show it to you. My proposal was to do something with Oakshott, texts, and circles. This is what I've come up with. 1. Draw your desired circle on your freezer paper and carefully cut the circle out keeping the freezer paper intact outside the circle. Try and centre the circle as best you can so there is a good 1" to 1.5" of freezer paper all around the circle. Press the freezer paper on to your background fabric square. 2. 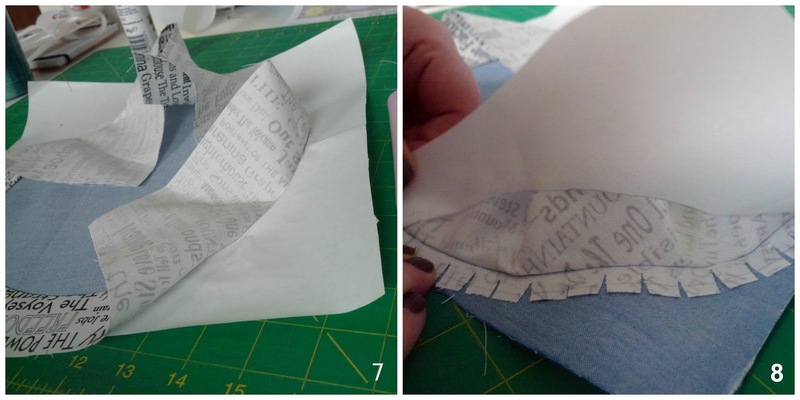 Roughly draw a circle about an inch smaller onto the fabric, so you can cut it out and have a good half inch of fabric still inside the freezer paper circle hole all the way around. At this stage I also draw around the edge of the freezer paper so that I have a perfect circle on the fabric in frixion pen. 3. Snip all around the fabric, making sure NOT to go so far as the freezer paper - incisions between 1/8th to 1/16th inch away from the paper should work. 4. Glue the newly created tabs and fold over to stick on to the freezer paper. This should give you a neat circle in your desired finished size. 5. Now glue the other side of the same fabric tabs. 6. Stick down your circle fabric, right side down, taking care to position it so that you have the same amount of fabric on each side, it should be about half an inch all around. Now leave the glue to dry completely. Why not prep another whilst you wait! 7. Carefully peel the background fabric off the waxed side of the freezer paper. 8. Again, taking care, peel the freezer paper off the glued on tabs of background fabric. It helps if you keep a finger on the tabs holding them down as you lift the paper up. Steps 7 and 8 do require care and attention, but you will get the hang of it quickly! 9. How things should look with the paper removed! 10. Follow the example of diagram nine and have the background fabric sitting wrong side up, and the surplus fabric sitting where the inside of your circle will be. Find your marked on circle line, and stitch on the line all the way around. 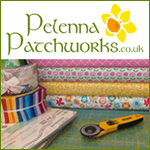 Set your machine to a nice short stitch, and take things nice and slowly so you dont get any unwanted folds or puckers. 11. How things should look after stitching! 12. You can trim the excess circle fabric now so that you have a nice quarter inch seam all around. 13. How things look after trimming circle fabric. 14. Right side up, there might be a teeny bit of a wave or wobble but a good press should sort this out. 15. Trim block to desired size. To assemble this quilt top I did a design on EQ7, although in this particular case I'm sure it would have been just as quick to draw it out on squared paper. I chose a rough size for the quilt, went with 12", 9" and 6" blocks for the circles, and just roughly decided where I wanted them. Then it was just a matter of filling in all the spaces between. Keeping positions in multiples of 3" helped. I sketched out the gaps between circle blocks into rectangles and subdivided them into patches to piece. Sounds painstaking I know, but really it wasn't. In fact, I'd love to keep going and make it bigger, but I know I'd find anything bigger to hard to quilt myself. Again, many thanks to Lynne, and to Oakshott for the great opportunity to work with the Impressions Shot Cottons. Such gorgeous fabrics, I think they'd make anything look good. Great quilt Sarah :) very clever! That's a genius way of doing inset circles!! 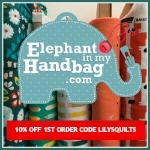 And you know how I love your text and coloured shape quilts - so, so lovely! 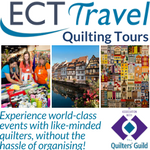 Great tute Sarah, and this quilt is going to be stunning! Pretty awesome quilt top! Well done! 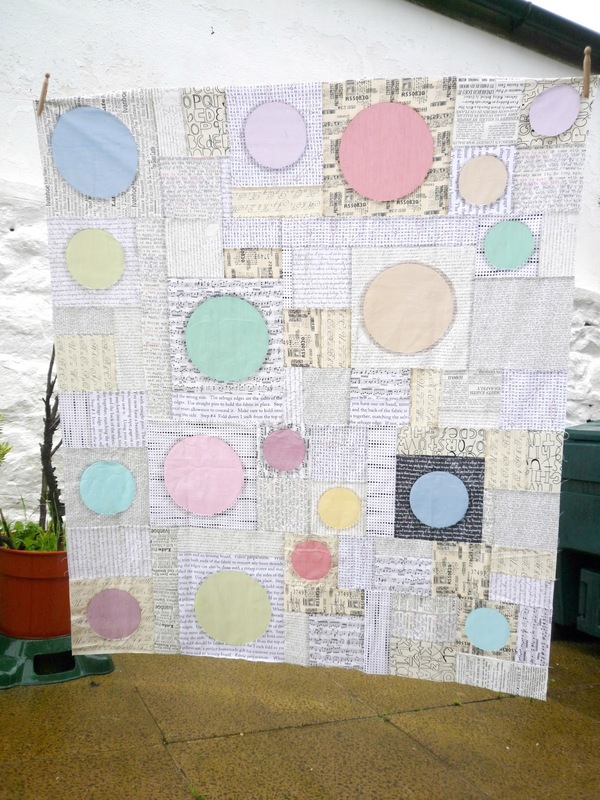 What a clever way to make circles ~ lovely quilt and wonderful tutorial! The quilt is beautiful and the tutorial is lovely and easy to understand. great quilt! and a great tutorial. thank you! Really a wonderful method. It is turning out splendid. The colors are amazing. Love the Oakshott, and those circles you made... Glorious!! Thanks for an excellent tutorial. I may actually be ok trying circles now! Absolutely gorgeous quilt and great tutorial! Great tutorial with lots of useful photos...actually looks like something I could manage! I have saved this for future reference....You is smart!!! !